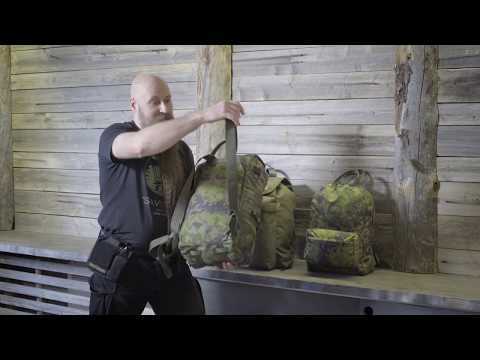 The paratroopers’ daypack 202 got a new cheery retro style appearance in the hands of designer Harri Koskinen. The traditional tightly woven cotton fabric and the plant-tanned leather parts give the Backpack a strong traditional appearance. But the upgrade is not only cosmetic; compared to the original backpack, some new convenient side pockets have also been added. A practical and smart little backpack for daily use. The main compartment of the Backpack (dimensions about 42 x 27 x 15 cm) is closed with a two-way zipper. The inside is without any additional compartments so even special and large items can fit in. Packing smartly is wise; for instance, folding one’s change of clothes and putting them against the back. This way, the Backpack would function as a back cushion. At the side, open flat pocket compartments (dimensions about 22 x 15 cm), where water bottles or even an umbrella fit easily. The outer pocket (dimensions about 15 x 23 x 5 cm) is closed with a zipper. It is convenient for smaller items, which might be needed quickly. The Backpack’s shoulder straps are simple leather straps. Height can be adjusted using the metal buckles in the lower corners. The Backpack can also be carried by hand by an extremely strong two-piece handle. External dimensions: height 42 cm, width 27 cm, depth 20 cm. Materials: Polyester SPUN canvas, plant-tanned leather, Kroko zippers and metal buckles.